What was the biggest disappointment for you? Having all of my friends get infected with diseases. What is your favorite swag item? 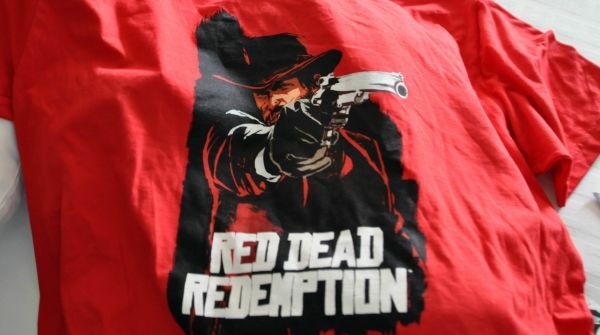 I really like the Red Dead Redemption Shirt. What was the most grueling swag to get? I waited around for 20 minutes at the end of the show trying to get a Borderlands shirt. But they had run out. Booo. What was your most pleasant surprise of the show? As far as displays go: The riding bull set up at the Darksiders booth; they dressed up a riding bull to look like War's horse from the game (ed. note: the horse's name is "Ruin", a cool horse name), and people got to ride and be bucked off. Swag-wise, I was actually caught off guard the first time someone asked me "What size?" As in, they had different tee-shirt sizes! Not just a generic one size fits all (broad-shouldered guys), but smalls and mediums for the rest of us. I didn't get to the Pandemic booth after they started handing out the lighters, so I missed that piece of swag. Otherwise, I was really stoked to play Bioshock 2, but it was just a trailer (that had already been released the previous Tuesday) in a small room with some decorations. Bummer. The Guild Wars art book - holy crap. They were really handing out full art books to everyone at the show (well, almost everyone.) Arttemis had to snag me one, but I got it none-the-less! Also, the comic book selection came in a close second; Dead Space: Extraction, Dark Void, and Spyborgs each had comics. All the energy drink garbage, and "gamer grub." Gamers don't really eat that crap, unhealthy people do. 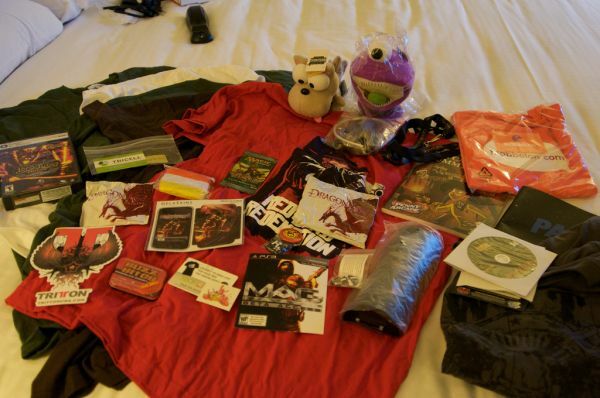 What was the most interesting swag to get? No More Heroes 2: Desperate Struggle was handing out toilet paper for playing their demo, and the one that really weirded me out was the Assassins Creed 2 trick. They handed you a piece of paper folded in half, and asked you to open it - as you open it, you hear it tearing. When you get it open, one one side is a guys head, and the other is his body and it says "Congratulations on your first kill" which I thought was very clever. Page created in 0.8217 seconds.